I am preparing this dosa for the first time and it was a huge success as my daughter loved it. Soak the whole Moong dal overnight or soak it for about 6-8 hrs. Soak the raw rice for 4 hrs. Heat a tawa/iron pan. Pour a ladle full of batter and spread it in round shape. After 2 mins flip on to the other side(until the bottom turns brown ) . Allow it to cook in low flame. Looks very crisp and perfect. Loved the addition of carrots in it. A healthy dish. 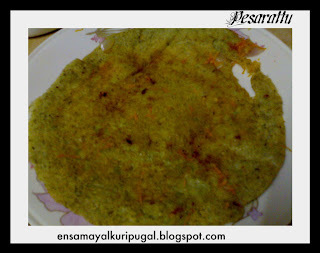 I love pesarattu and especially with carrot makes it more healthy.. These dosa look so healthy and yumm!!!! 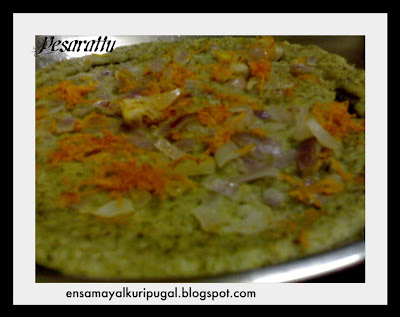 Dosa looks fabulous with the carrot and onion sprinkles on top! That sure is a delicacy... It looks lovely & tempting... I tried once, but failed..... May be now could try again, with your guidance of course.... I would ASAP!!!! Your version of garnishing the dosa adds flavour too..
my mil also makes it in the same way.adding carrot is new to me.Rice,daland veggies balanced diet. 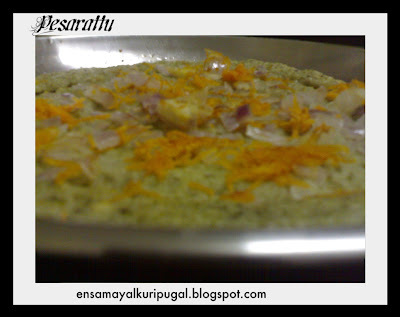 My all time favourite, nutritious and healthy dosa, love those carrot and onion sprinkles..
looks so delicious. my fav. one!! Thanks for all ur lovely comments. Lovely recipes you got here..
A very healthy and a filling dosa, we make upma and allam chutney with pesarattu..
thanks for knocking the door of my blog. You have very nice collection of traditional food.i m gonna follow u. Thanks for visiting my blog and following it...love the artistry of your blog and recipes. Will be following you regularly to catch up with your latest kitchen creations! Hai!!! Aruna, thanks for stopping by in my blog.You got very nice blog, i like pesarattu, healthy one. The pics are excellent looks delicious.